Build a structure that can support the most possible weight. 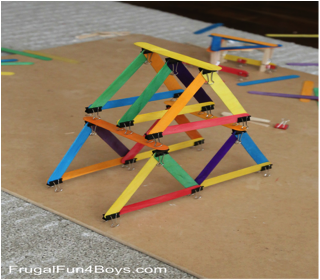 Have children break out into teams of 3-4 and challenge them to build structures that support weight. They will use the binder clips to attach the clothespins and craft sticks to build supports for books. 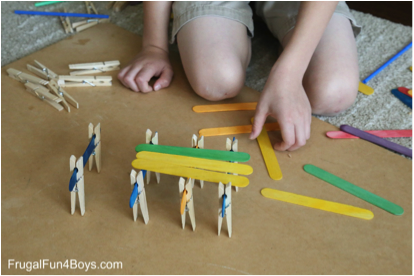 Two clothespins with a craft stick between them make great supports for a structure. The more books supported, the better. Try using triangles in the design (since triangles are a stronger shape). 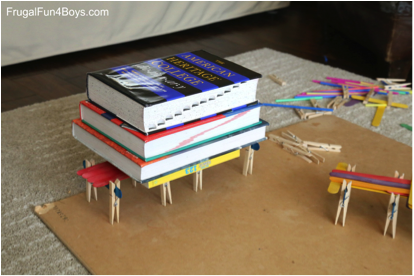 WHAT THEY LEARN:Explore with different ways to build supporting structures. What types of structures are more stable? Also a great activity for hand-eye coordination.